I noticed last night that the end of Louie's tail had no hair and was blackish, like dead I assume. Today he was on the bottom of his case holding it with his hand and trying to break it off, since it's only holding like a thread in spots. He's eating, arguing with case mate, running on his wheel. A year ago, we added a baby female. Louie can't stand how she pesters his rear end like she is in heat. Louie is neutered. They squabble alot in cage, when eating, etc. I have two separate eating arrangements. I had Louie out last week for a while and didn't notice anything. Our 8 month old puppy just had knee surgery and with all that's involved in that, they have been neglected except for eating, touching through cage. I never could warm up to the female. I'm trying to figure out how to make the e-collar, but what else should I do? I've had Louie for 4 years and Mia for over a year now. If I use an e-collar, how will he get in his pouch, etc. etc. Thanks, I'm a nervous wreck! He needs to be seen by a vet as soon as possible to have the portion of the tail that is dead removed. In addition, since there is some tension in the cage, it might be a good idea to give him his own space - separate him from the rest of the group. More than likely you will need to do this if he has surgery anyway. If you manage to make and get him into an e-collar, you may need to help him eat. 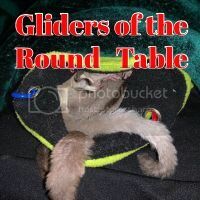 Some gliders have a little trouble eating with the collar on. You will also need to make sure he has a hammock, box or x-large pouch for sleeping. He will not be able to defend himself in an e-collar if the others start picking on his tail. He really should be in a separate cage for a while. When you do take him in, request that they do not shave the tail for surgery. He will come home on meds. If the part the hair while scrubbing the area for surgery they can get away without shaving it. My experience with all the tail amps I have had done, 99% of the time they don't go after their tail if it isn't shaved. The gliders where the vet has shaved went after their tails resulting in another amputation. How are you and little Louie? Try not to beat yourself up our him. Things happen. Please keep us posted and we will be thinking of you and Louie.